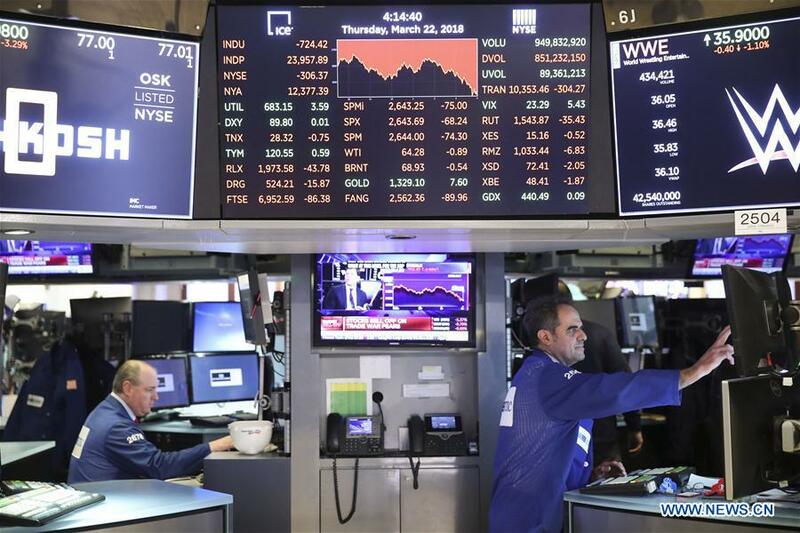 U.S. stocks ended lower on Thursday, with the Dow plunging over 700 points, after the U.S. President Donald Trump announced to impose tariff on imported products from China. The Dow Jones Industrial Average lost 724.42 points, or 2.93 percent, to 23,957.89. The S&P 500 decreased 68.24 points, or 2.52 percent, to 2,643.69. The Nasdaq Composite Index was down 178.61 points, or 2.43 percent, to 7,166.68. Despite strong warnings from business groups and trade experts, U.S. President Donald Trump on Thursday signed a memorandum that could impose tariffs on up to US$60 billion of imports from China, the latest unilateral move that poses a threat to global trade. Analysts said Trump's protectionism made investors nervous and history had showed that such trade polices could harm the economy. The Cboe Volatility index (VIX), widely considered the best gauge of fear in the market, rallied 30.68 percent to 23.34 in late trading on Thursday. Meanwhile, traders were digesting the latest decision from the Federal Reserve. The U.S. central bank on Wednesday raised the benchmark interest rate by 25 basis points and signaled two more rate hikes in 2018, citing "strengthened" economic outlook in recent months.